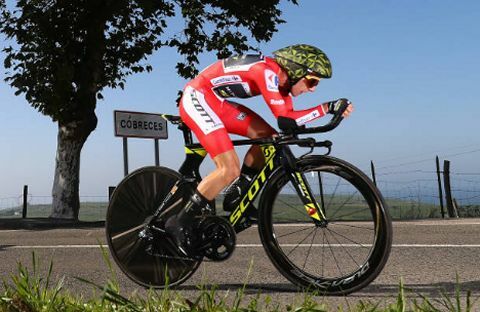 Britain’s Simon Yates has extended his lead at the Vuelta a Espana with a strong time trial performance on stage 16. 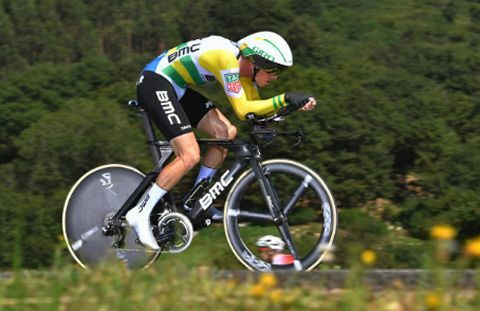 The Mitchelton-SCOTT rider finished 13th on the stage, won by Rohan Dennis (BMC Racing Team), and extended his overall lead to Alejandro Valverde (Movistar Team) to 33seconds whilst their fellow contenders shuffled around below. The 35km suited the specialist time triallists with winner Dennis averaging over 50km per hour. Yates tried to pace himself on the first section of the race, before putting it all on the line to the finish. The 26-year-old was sixth fastest at the first intermediate checkpoint after 10km and the second after 21km before sacrificing a few positions in the closing kilometres. Yates’ performance for 13th place saw him lose time to Steven Kruijswijk (LottoNL-Jumbo) and Enric Mas (Quickstep Floors) but gain on his other competitors. Valverde lost nine seconds to Yates, whilst Colombian duo Nairo Quintana (Movistar Team) and Miguel Angel Lopez (Astana Pro Team) lost 42 seconds and 51 seconds each. Yates now has 33 seconds to Valverde, 52 seconds to Kruijswijk, one-minute 15 seconds to Quintana, one-minute 30 seconds to Mas and one-minute 34 seconds to Lopez. “Thirty-three seconds over Valverde is not that much, I had much more of an advantage in the Giro, over a minute and we all know how that finished in the end, but there’s still a long way to here and we’ll see how tomorrow goes. After winning both time trials, your goal coming into the race, you now leave the race to focus on your next goal. How is everything looking for the World Championships? “Everything is looking good for the World Championships. I’ll be heading home now and preparing specifically for the time trial and team time trial, so hopefully I will have one more box ticked by the end of the season. So far, I think the Vuelta has been the best preparation for the Worlds in Innsbruck. It has been tough, especially the first nine days with the heat which really knocked me around. Luckily, it started to cool down and I started to feel better and better. I’d rather feel better as I get further into a Grand Tour than worse. So, I think this race has been the perfect preparation for the World Championships. Alejandro Valverde: “Overall, I felt fine during today’s effort. To be honest, I was trying to clock a good early reference and went really strong. Then, halfway through the TT, where the headwinds were heavier, I struggled a bit more to find a good pace. However, I was able to gain some time back again into the last few kilometers, which means that I was able to finish strong. I think I did a good time trial – it was just that Yates, Mas and Kruijswijk were better.